Families in Mali are running out of food with some reportedly eating meals “only made of cooked leaves” according to the UN World Food Programme. Mali, located in West Africa’s Sahel region, is one of the countries caught in a severe food crisis. 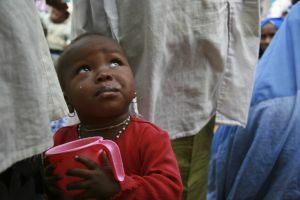 The World Food Programme (WFP) says there are 4.6 million people at risk of hunger in Mali. Drought has struck the country but so too has internal strife with a military coup earlier this year followed by increased rebellion in the Northern part of the country. The conflict has displaced 174,000 people within Mali and they need humanitarian aid. Even more Malians have been displaced to neighboring countries including Burkina Faso and Mauritania. WFP says it needs 55 million dollars to fund its relief work for those displaced inside Mali and the surrounding countries. Within Mali, WFP has reached over 100,000 children with nutritional help including the food Plumpy’Sup. This peanut paste keeps small children from suffering devastating physical and mental damage from malnutrition. Katie Seaborne of Save the Children says the charity is providing nutritional support in Mali, Niger and Burkina Faso. In Burkina Faso, where child malnutrition rates have increased this year, Save the Children is using both Plumpy’Sup and Plumpy’Nut, the latter generally used to treat the most severe cases of malnutrition. Throughout the entire Sahel region of Africa, WFP is reporting a shortage of $320 million dollars in funding to provide food aid.